I live and breathe web. Passionately. For the last few years, I have helped numerous small to medium sized businesses get on their feet. Built their websites, strategized with their owners, planned their social media campaigns and optimised their online presence. I have watched not all, but many of these businesses establish themselves, grow stronger and firmly nestling into their respective business ecosystems. Until, earlier this year, I was hit by an epiphany. I realised that after all these years of growing and establishing other businesses, I still felt like a start-up. When asked what I do for work, I would shrug and say: “I’m self-employed”, like it was something I needed to be ashamed of. I often thought that all the businesses I have helped grow over the years are doing a better job at actually being businesses than I was. My inner critic constantly told me that I was not good enough, that I needed to push harder, be more proactive and more successful. It was a tiring voice to listen to, and I was exhausted. I wasn’t lacking ambition for my business. On the contrary: I often thought that one day I’d like to expand and hire regular staff. Have an actual office to go to, one that’s not adjacent to my bedroom. Prepare for pitches, play with the big boys. From the outside, it certainly looked like I was leading an enviable life: a house in one of the world’s most beautiful cities, with the ocean right at my doorstep. Two beautiful kids and enough money to care for them, send them to a good school and travel. I was also pulling in more work than I could handle. Things seemed to be going well – yet I still felt like I wasn’t not enough. My clients repeatedly told me that a big part of their success stemmed from the work I put into their businesses. What was stopping me from doing the same for my own business, I wondered? Low self-esteem? Too much on my plate? The inability to take responsibility for my own professional life? Or was I just being too hard on myself? At least that was the situation at the beginning of the year. Below the surface of this “enviable life”, I was running multiple projects and businesses simultaneously, while looking after the kids, navigating a crumbling marriage and the news of my dad’s terminal cancer. I did not go to the ground, but I came close and realised that things needed to change. They say the first step to changing behaviour is admitting that things aren’t going well. I was surrounded by glamourous Instagram posts and friends being promoted, buying houses and birthing babies that, if you believed Facebook, were on a path to becoming the next Einstein before primary school. When everyone around you seems to have their lives together, opening up and admitting that your own life isn’t going well is a daunting revelation. But only through opening up did I realise that all these friends are also leading shell lives, that their mortgages are crushing them and destroying their marriages, and that their kids are struggling in school. Only though opening up did I start meaningful conversations that encouraged honesty, vulnerability and change. Only through opening up did I manage to silence my inner critic and move forward, beyond my comfort zone, into new spaces that have made me a happier and more successful woman. This was probably the hardest lesson to learn for me. Being a mother, HSP and a woman in general, my default mode is to strive for harmony. That means I will usually put my own desires behind those of other people. I was literally burning out trying to please everyone. Stepping out of that mode has been a valuable lesson, and easier than I thought (once taken consciously). I now don’t try to please everyone, but I go after what I believe to be right for me, my kids and my business. This also means caring less about what other people think about me. It means giving honest answers rather than the ones I think people want to hear. This particular point is about acknowledging past mistakes and learning from them to move on and become better. In the past, I could spend hours replaying negative events and focussing on what went wrong, without effecting any change. I now try to make a conscious effort to focus on solutions instead. Replaying negative outcomes is only useful while it helps prevent similar outcomes in the future, and so I look at every mistake as a learning opportunity. Instead of saying “The project failed, I am just not good at this”, I now say: “Why did the project fail and what can I do to prevent this from happening next time?”. It’s a painful process, often one that involves admitting my own weaknesses, but has been tremendously helpful in establishing a positive mindset and producing successful outcomes. Taking responsibility for my work and my actions and putting myself ‘out there’ even though I was feeling less than adequate was a painful experience at first. I grew up loving the sidelines, not the spotlight. Going after the things I wanted meant that I had to repeatedly jump over my own shadow and remind myself that even though other people seemingly knew what they were doing, most of them were feeling just as insecure and inadequate as I was. I quickly learned that my work was still exceptional, even as I was making mistakes along the way, and that I was achieving a lot more stepping out of my comfort zone than stayeing in it. Yes. I know this might conflict with some of the other points I am trying to make here – don’t overload, don’t stress – however, I found that not getting started leads to endless procrastination and frustration and work not getting done “tomorrow” either, but maybe next week, or next month instead – if at all. Sometimes I don’t feel like getting started on a project. I still force myself, even if I only spend ten minutes to get my head around it. It takes discipline, especially with my tight schedule between school runs, swimming lessons, and dinner rush. I actually plan my day in my calendar now and try to stick to the routine I set myself there. I spend less time online, on Facebook or chatting to people, and more time actually working – which leaves me hugely satisfied at night. When I first started my own business, I did not say no to a single project. The prospect of going without work, running out of projects or being left with no income was constantly in the back of my mind, and so I loaded on as much as I could. This soon produced poorer and poorer results, as I was finding less and less time to produce quality work. I was also feeling really run down and stressed. I now say no to stuff: the SEO project that is conflicting with another client’s SEO, the website that needs to be done by tomorrow, the hours of feedback loops over a simple logo. I say no. I create better work that way. Self-care is such a buzz word these days, and unfortunately it is all too often confused with a glass of wine in the evening. While I, too, enjoy said glass of wine occasionally, rewarding myself with alcohol is not something I would categorise as self-care. While driving yourself hard to get things done efficiently and professionally, don’t forget to look after the private person within you. This might mean saying no to projects when you have too much on your plate. Taking a bath at night and learning to meditate. Social outlets, a surf session, yoga classes. Being forgiving and gentle with yourself. In my case, it also meant saying yes to chocolate, help from other people, and sleep more often. It meant acknowledging the vulnerability within me. Exercise is a giant outlet. Exercise keeps me centred and focussed; it is my reward for when all other things are done. It keeps me looking good when I rock up to client meetings. I keep fit and toned doing handstands and acrobatics. Plus, I love surfing and diving, and ocean time is head-clearing time. Triple-win! I know that finding the time for exercise can be a challenge. That’s why I often end up upside-down on my yoga mat at 10 p.m. after the kids are in bed, all emails are sent and the kitchen in clean. You’ll find me there every single day, no matter how tired I am. Whether you like lifting weights, going for a run, or dipping into the ocean, stop finding excuses and just do it. It will help. Seems like a lot all at once? It is. But only in the beginning. Take it step-by-step, and these things will become second nature. 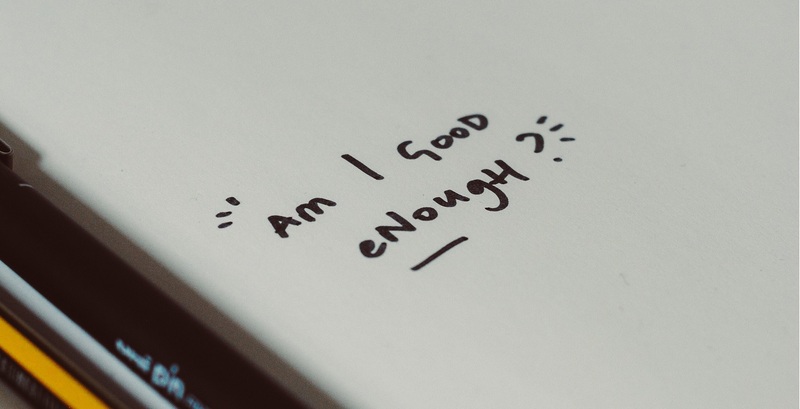 We live in a society where we are constantly led to believe that we are not good enough, that everyone else is more successful, smarter and happier. The fact is: Self-esteem shouldn’t need to be earned. We are all worthy of love right from the start. But self-esteem must be cultivated. Keep walking your path and don’t lose sight of the amazing being you are!